Notes: Refused to install unless I changed my XP language to Japanese: Control Panel->Regional and Lanaguage Options->Advanced->Language for non-Unicode programs=Japanese. 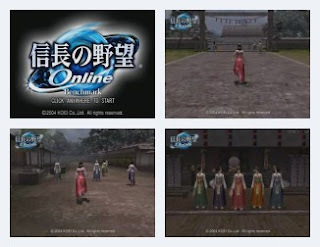 Also known as "Nobunaga's Ambition Online." The long-running Nobunaga no Yabou series of strategy games has players trying to unify feudal Japan, but now you can do it in an MMO. The benchmark follows a group of women running through a town. No action to speak of, and nothing really interesting to look at. Interesting music but annoying footsteps-on-dirt sound effect which runs through the entire test. Short running time (no pun intended.) Not recommended.